It had been a while since I’d read the first novel of the Legend of the Galactic Heroes series, but thanks to Tanaka’s no-frills, warp-speed style and Huddleston’s smooth translation, I had no trouble jumping right back in. And like Volume 1, Volume 2: Ambition is a tantalizing mix of political intrigue, colossal space battles, and the dark side of- you guessed it, personal ambition. A hundred billion stars gleamed with a hundred billion lights. Those lights were weak, however, and the greater part of space’s infinite expanse was dominated by obsidian darkness. Love it. Tanaka’s all about perspective, which we’ll need when we follow him into the complicated storyline of two, count ’em two, civil wars within the constantly-warring Galactic Empire and the Free Planets Alliance. Early on, the FPA’s Yang Wen-li figures out that the up-and-coming imperial marshal Reinhard von Lohengramm of the Galactic Empire is preparing for a civil war against the empire’s long-established aristocracy. In an effort to gain as much power as possible (and shove aside the legitimate emperor), Reinhard must defeat these nobles soundly. But if he doesn’t want to risk some sort of GE nobles’ alliance with the FPA, or some such arrangement, Reinhard would need to stir up trouble in the FPA itself to keep it occupied until he has gained power. Yang Wen-li figures this out, but Reinhard doesn’t know that…thus begins a whirlwind of a story, in which scheming nobles undercut each other, the FPA falters after a coup installs a veritable dictatorship (a coup cooked up by Reinhard), and then there’s the scene where Yang Wen-li obliterating some massive defense satellites with planet-sized hunks of ice…but you’ll have to read about that yourself! Friendship, courage, trust, honor: all of the actors in this drama must decide to whom they’ll pledge their loyalty and how far they’re willing to go for what they believe. 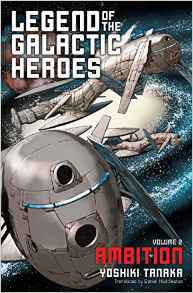 Volume 2: Ambition is everything you want a space opera to be, and it sets up the following novels quite nicely. I encourage you to check it out. After all, the fourth volume is coming out in English this year!